But instead my fingers are smudged with paint and gesso and I am having the time of life creating my first ever art journal. It is such a great way for me to match my need to create with my love of words. I am learning so much about myself in the process. I hope to show you a peek every week or so and hopefully let you in on my growth as an artist. For now, I better go wash my hands and figure out what's for dinner. Patty, looks lovely! Sounds like you are enjoying yourself! Oh I started this journey about four months ago and I am so HAPPY!!! I am equally as happy to hear you starting this journey. It is wonderfully therapeutic. I'd like to hear more about this. Your images are so pretty. did you do it?? amazing dear!!! Beautiful.... keep discovering and exploring. 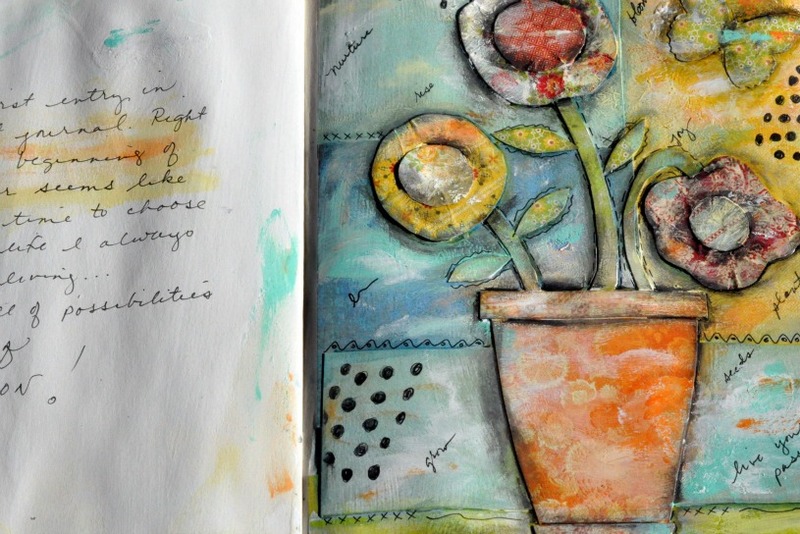 Loved seeing a bit of your art journal. 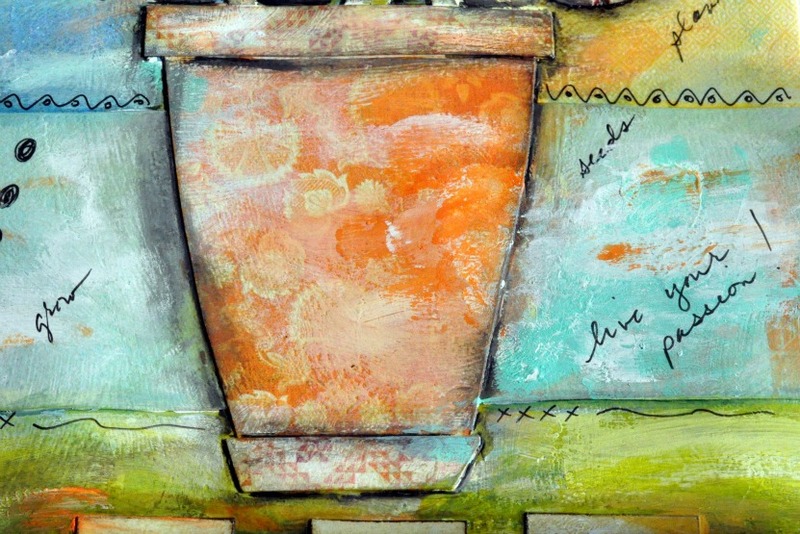 The texture-y design on the terracotta colored flower pot really caught my eye. In fact, everything caught my eye. Wonderful work! Thanks for showing it to us. Looks like great fun Patty!! I love it!! What a lovely page. Your little bits of writing are so beautiful & the fabulous textures are so striking. I look forward to watching your journey. Isn't it wonderful to create? Love your journal... the colors are beautiful. The dishes and dust bunnies ccan wait! Enjoy! Yeah!!!!!!!!!!! for you! I have been wanting to do this also, you have inspired me. The other will still be there, but I bet this will be what brings you joy! I am in awe! I am a journal junkie. It is my best friend. How I would love to learn the art of journal making. You should make them to sell!! Found your blog from life at empty nest and am loving reading! It's beautiful! I've been aching to do something like this. But I don't have your talent for it. These pages are beautiful! Can you share how you are doing them? 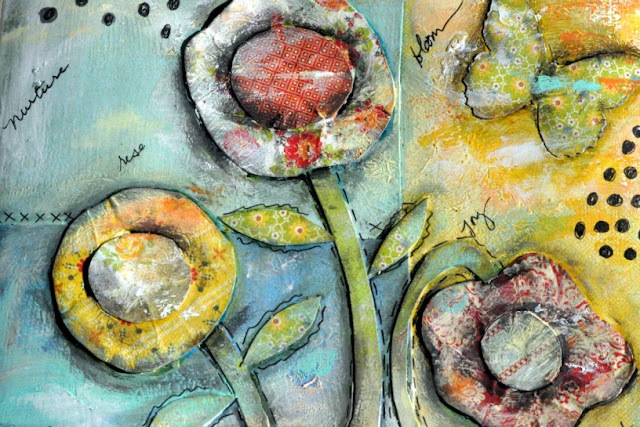 Love your art journal. You are doing a fantastic job. Wonderful way to create and reflect. Saw you on Balzer designs, love your work! And your story is inspiring!